Hi, About 6 months ago, Max our 8 year old cocker began a new night time behavior. He sleeps peacefully at my feet when my husband is not in the den. At night when we are in the den together, Max sits on the floor and stares and whines anxiously at my husband. He is not hungry, not thirsty, and he doesn't need to go out. We've taken him to the vet and he is not doing this because he is in pain. If my husband leaves the den, Max lies down at my feet again and is quiet. We've tried ignoring his behavior; telling him no, and putting him in his kennel for a time out, but the only thing that works is if my husband leaves the room. Max does this from about 6:00 pm until 10:00 when we go to bed. Any suggestions about why he would do this and what we can do to correct it? The whining that Max is doing is known as 'demand whining' - he's demanding something from either you or your husband. It's his way of communicating. He's doing what he knows to work for him because each time he whines, you react in his favor. Who said Cocker Spaniels were daft? It's good that you know he doesn't need to go out, to be fed or watered, etc. and that your vet has confirmed that Max is not in pain. So, what could it possibly be? I'm not convinced that when your husband leaves the room and Max stops whining, that that's what he wanted. It seems like he's 'communicating' with your husband because you say he's looking at him when he's whining. Could it be that when your husband leaves the room Max realizes that he's not going to get what he wants and so stops whining? Is there something that Max and your husband do together? Does your husband walk him? Could he need exercising? Does he play ball or a little rough and tumble with him? Could Max just want a little play time? Is he bored? If it's any of these, more exercise, play or a stuffed Kong would help. He's been whining for 6 months and during this time he's learned that whining gets him what he wants - now we need to help him break the habit. The easiest way to do this is to ignore his whining, no matter what. I know you have said you have tried ignoring him, but you also said that your husband left the room and he settled. So I'm confused. What happens if your husbands stays in the room? Does Max continue whining? For 4 hours? Please indulge me. The next time Max whines, ignore him. Don't look at him, don't tell him to stop - simply ignore him. As soon as he stops, throw him a small treat and/or praise him. Tell him he's a good quiet boy! Next time he whines and then stops, leave it a second or two before you reward him. Gradually build on this so that Max is quiet for increasingly longer before you reward him. Eventually, he'll realize two things: that his previous tactics no longer work and he's rewarded for being quiet. My cocker spaniel whines at my husband because he knows eventually my husband will give him attention. If my husband is gone the dog doesn't act that way! I'd say her dog wants her husbands attention. Your puppy is very young and is probably missing her mum and her litter-mates. She's also in a strange new home with new people around her. Nothing is familiar to her so she's bound to be frightened/nervous and will cry. Read through the advice on this page, and this one, howling and crying. The main think to remember is, don't give in to your puppy if she cries at night, as it will only serve to teach her that when she 'demands' your attention, you give it. My family just got a cocker spaniel puppy 8 weeks old. Our goal is to have her house-broken so it is her first night and we put her in her kennel and all she does whine and won't stop so we take her out and she kinda still whining what should we do? 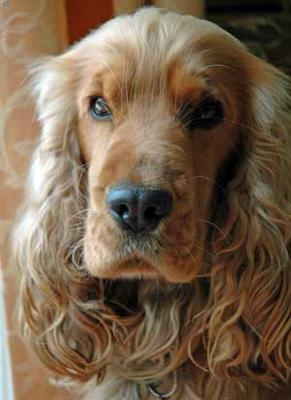 My cocker spaniel started whining a little while ago and I'm certain that I was the cause. You see I gave him what he wanted (anything for a quiet life). However, I became fed up of hearing him whine (it's not attractive is it?) and so I decided to try and undo what I had allowed to become a habit. I did exactly what Pauline has suggested in this post. It took a bit of patience, but it paid off eventually. Now he only whines occasionally and I NEVER give him what he wants when he whines. Hope you get your cocker sorted before long.